This website is designed for professionals working with victims or perpetrators of stalking. Using the tabs above you can find information about the Stalking Risk Profile, a structured risk assessment guide for clinicians, as well as links to useful information about stalking, including victim resources, legislation, the latest stalking research, and ways to find an expert on stalking in your area. 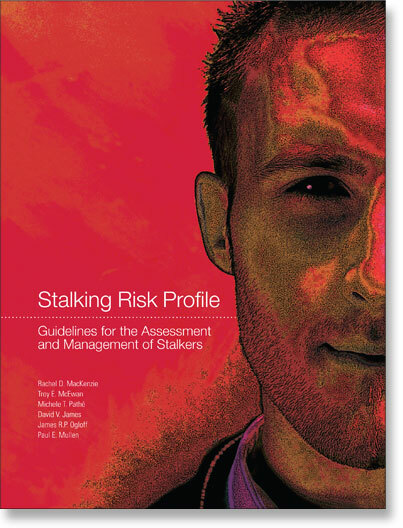 To purchase the Stalking Risk Profile or find and book into a training workshop in your region, click on the ‘Stalking Risk Profile’ tab or the image to the right. The Members section is for professionals who have attended a Stalking Risk Profile training workshop and includes access to rating forms, case studies, examples of scoring the Stalking Risk Profile and contact with other professionals via chat forums and the bulletin board. To ensure a safe and enjoyable environment for all users, please read the Terms and Conditions of Use and Disclaimer.